Presto Skid Lifters combine the mobility of hand pallet jack with the lifting and positioning capabilities of a scissor lift table. They are ideal for transporting loads on skids or open bottom pallets, feeding conveyors, steel punches, and printing presses or even as adjustable height workstations. Choose from either the manual hand pump or the battery powered lift model. For use with open bottom skids or pallets only. The PSL-22/20-E Electric Skid Lifter has a 2,500 pound capacity. Overall dimension is 20 1/2", raise.. The PSL-22/27-E Electric Skid Lifter has a 2,500 pound capacity. Overall dimension is 27", raises lo.. The PSL-25/20-M Manual Skid Lifter has a 2,500 pound capacity. Overall dimension is 21 1/4", raises .. The PSL-25/27-M Manual Skid Lifter has a 2,500 pound capacity. Overall Dimension is 27", raises load.. 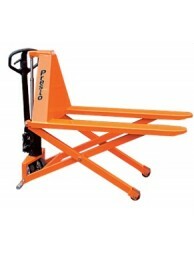 The PSL-30/20-M Manual Skid Lifter has a 3,000 pound capacity. Overall Dimension is 21 1/4", raises .. The PSL-30/27-M Manual Skid Lifter has a 3,000 pound capacity. Overall Dimension is 27", raises load..